dance music | MEOW hear this! I like to pretend I can dance, anyway. I even have real ballet slippers for when I feel like REALLY faking it. Around the house. I’ve always wanted to take pole dancing classes. Despite the stigma attached to stripping, I actually find it to be an entrancing form of dance. And then there’s the fun dancing. I adore plopping one of the kitties in my lap, taking his arms and sing the “Bird bird bird, bird is the word” song and making them dance. Torture? Maybe. Although the look on their faces is usually one of “I’m going to puke on your shoes later,” I know they secretly enjoy it. 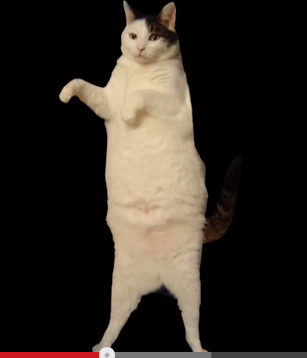 Look at this cat dance. Cat. I’m a kitty cat. And I dance dance dance and I dance dance dance. See? Love it. I DO have a favorite playlist of dance songs, of which I will share some in hopes it will entice someone to shake their booty. In conclusion, I urge everyone to turn up the volume on whatever it is you listen to and get down like you’re Jennifer Beals. Who cares who’s watching?